In this close up we are looking at one of the lamination surfaces. Shales commonly break along these surfaces. One might be tempted to consider this specimen a metamorphic slate, and indeed shales turn into slate with Barrovian metamorphism. 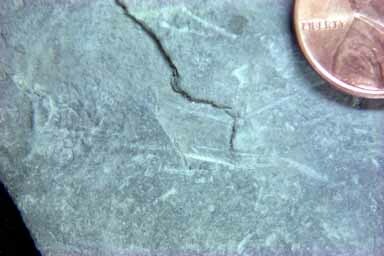 Slates, however, tend to be harder, and the scratches we see on the surface of this specimen make it unlikely it has undergone much if any metamorphism.